Safety on the Kuskokwim River has become more expensive during the nation’s longest-running partial federal government shutdown. For decades, Bethel Search and Rescue has flown with the U.S. Fish and Wildlife Service to monitor winter river conditions. But with that government service closed, the all-volunteer group is having to turn to pricey commercial airlines for help. When the weather changes, so does the Kuskokwim River. But what doesn’t change is that people still need to travel. Bethel Search and Rescue lets travelers know which routes on the river are safe. Tragedies like losing people to open holes in the ice — which has not happened this winter, but which has happened too many times in the past. 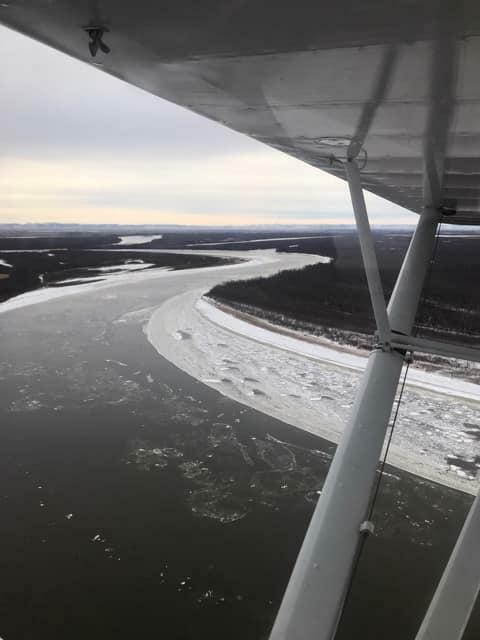 “So that’s kind of the biggest reason as to why we do a lot of the surveys,” Barr said, referring to Bethel Search and Rescue flying the river, observing and taking note of ice conditions. The most important time to check these ice conditions is after a warm-up, and Bethel just experienced a big warm-up. This weekend temperatures plummeted to 25 degrees below zero. Then, in the following days, temperatures shot up to nearly 40 degrees above. Usually, Bethel Search and Rescue would be calling a pilot at the local U.S. Fish and Wildlife Service office to schedule a survey, but the current government shutdown has shuttered that partnership. “We’ve always had a relationship with them. I would say it would stretch more than 20 years,” Barr said. The U. S. Fish and Wildlife Service does not charge Bethel Search and Rescue for these flights. Now the organization is having to turn to commercial airlines to charter a plane; the going rate is about $1,000 per hour. That’s a steep price for a donation-based organization that runs off an annual budget of about $60,000. Barr believes that there are better ways for the nation’s leaders to work out issues rather than by closing the government. “I don’t necessarily think that butting heads within government is a great example to the American people,” Barr stated. Organizations along the Kuskokwim River have another example to offer. Last week two tribes — Bethel’s Orutsararmiut Native Council and the Native Village of Napaimute — helped Bethel Search and Rescue fund a charter flight, making everyone a bit safer.